CRAIG, Colo. - T. Wright Dickinson remembers when he reached the end of his rope. A year ago last June, the Moffat County, Colo., commissioner sat at a meeting more than 140 miles from his isolated ranch and listened while wilderness advocates announced that more acres had been added to a list of land parcels they wanted protected in his county. Already on the list were 86,000 acres of juniper-dotted badlands and painted bluffs known as the Vermillion Basin, where Dickinson and his family have grazed cattle for four generations. The addition of more land was a surprise, says Dickinson. "There was a growing sense of frustration with these groups continuing to make proposals for special land designations without talking to us." Dickinson left the meeting even more determined to rein in what he says has been a steady assault on the county's "custom and culture." Over the next several months, he and his fellow commissioners from the sparsely populated northwest corner of the state completed a draft plan that outlines handing over control of 1.7 million acres of federal land to a locally weighted board of trustees. The county's commissioners are shopping around Washington, D.C., for support of the plan, released early this year. So far, it doesn't appear to be gathering much steam, even from an administration that says it's looking for alternative ways to manage federal land (HCN, 3/18/02: Zoning code may squeeze Aspen ranchers). But it has caught the attention of one of the West's most aggressive anti-grazing activists - attention that Moffat County commissioners might wish they had never drawn. The blueprint, named the Northwest Colorado Working Landscape Trust, would create a seven-person board appointed by the governor and county commissioners to manage all federal land in the county, including Dinosaur National Monument, Bureau of Land Management lands and a slice of Routt National Forest. Board members would represent mining and oil, local business, ranching and farming, recreation, landowners, the environment and local government. At least four trustees would be Moffat County residents. The trust creates "a level playing field that moves beyond seeing who can push who off the table," says Dickinson. The key to leveling the field is a decision-making process based on "unanimous consent," he says, where every representative must agree before decisions are made. But some decisions have already been made: The plan states that "Congress shall not designate any new wilderness areas in Moffat County, and (shall) release all existing Wilderness Study Areas to management through the Trust." Any citizen appeal must go through an advisory board before a "go-to-court pass" is issued, says Dickinson. Suzanne Jones, the Wilderness Society's Colorado state director, says the trust is nothing more than a local land grab that would cut wilderness advocates entirely out of the game. "This seven-person junta turns the system on its head," she says. "Even if you don't like wilderness, this is bad public policy." "I'm all for the concept of collaboration, but handing over all the federal lands to a trust greatly concerns me," says Chas Cartwright, superintendent of Dinosaur National Monument, who wonders what the role of federal land-management agencies would be. "I have a hard time envisioning that our mandate of preserving and protecting the land could be served." 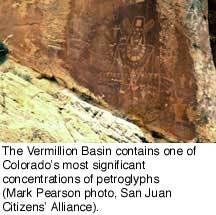 The real prize for both sides is not the Park Service monument, but the Vermillion Basin, which is managed by the Bureau of Land Management. Filled with sculpted canyons and petroglyphs, as well as elk and sage grouse, the basin is high on environmentalists' lists for protection. Last July, Rep. Diana DeGette, D-Colo., introduced legislation to designate nearly 1.6 million acres of the state's BLM land, including the Vermillion Basin, as wilderness. But the basin holds potentially vast reserves of natural gas that commissioners say would pump money into the local economy -- millions more dollars in tax revenues and employment than the service jobs that a wilderness designation would bring, says Dickinson. "I won't trade mineral jobs for burger-flipper jobs on any day of the week." While the administration isn't paying much attention to the land trust plan, it is listening to the commissioners. Interior Secretary Gale Norton has delayed authorizing a study that will settle the question of whether or not the Vermillion Basin meets the definition of wilderness. Tapping into gas isn't the only concern. Ranchers also worry that wilderness could cut into their operations. And in a county that touts itself as the "Real West," cattle have clout. Although coal-fired electricity plants and strip mines provide the lion's share of taxes for the county's coffers, ranchers still dominate the local political landscape. Dickinson and a second commissioner who helped draft the trust plan, Mariana Raftopoulos, are from two of the largest ranching operations in the state. Together, the Dickinson and Raftopoulos families control about 340,000 acres of federal grazing land in the county, including Dickinson's permits in the Vermillion Basin. 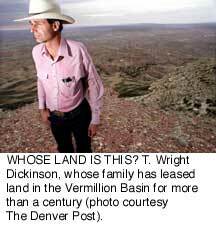 This grip by grazing interests and the struggle over the Vermillion Basin have brought Moffat County into the crosshairs of Jon Marvel, who has sued land-management agencies, bid on state grazing leases and attacked the West's large public-land permittees (HCN, 8/2/99: Jon Marvel vs. the Marlboro Man). Last winter, Marvel's group, the Western Watersheds Project, filed an appeal to stop the BLM from renewing grazing permits held by the Raftopoulos family. The Interior Board of Land Appeals rejected the appeal, but it's raised the hackles of local ranchers. "Seventy percent of our operation depends on public lands," says Steve Raftopoulos. "It would have been devastating to us. It bothers me that they are only concerned with the end goal. If people are truly concerned with the landscape, they'd come to the table and work through the process." Marvel says it's too late to come to the table. He's considering filing suit in federal court over the Raftopoulos family's grazing permits and expects to appeal Dickinson's grazing permits that are currently up for renewal. "We can shine a light on the ranchers who are ruining the county and beating up on the land," says Marvel. He also hopes to draw the public's attention to the county's land-trust plan - a plan, he says, designed to protect the economic interests of the commissioners. Protecting public-land ranchers is the key to protecting land in Moffat County, says Dickinson. "If these people don't have a belief in the future, their private land is for sale." So far, says Dickinson, his family has never sold any of its land for development. "But if that's the only option, you can kiss your elk-calving grounds goodbye." Because implementing the trust would require changes to the cornerstones of national environmental law, including the National Environmental Policy Act and the Federal Land Policy Management Act, it appears that congressional approval of the trust won't come any time soon. So far, no one from Colorado's delegation has agreed to carry the ball. But Dickinson says he'll continue to stump for the plan and that the county won't reconsider its stance on wilderness. Wilderness "is inappropriate for our community," says Dickinson. "It doesn't fit in Moffat County." Robyn Morrison reports for High Country News from Paonia, Colorado. Jon Marvel, Western Watersheds Project, 208/788-2290.